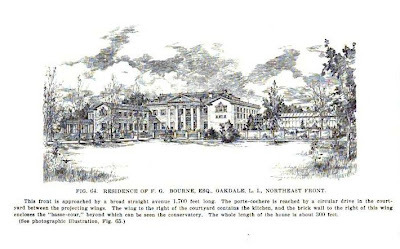 'Indian Neck Hall', the estate of Frederick Gilbert Bourne designed by Ernest Flagg between 1897-1900 in Oakdale. Bourne was the president of the Singer Manufacturing Company, a company which Flagg supplied with two buildings in Manhattan. 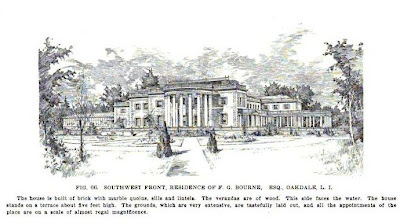 On the 1,000+ acre estate Flagg combined the Federal Revival style on the exterior with what he called "the modern French Renaissance" style on the interior. 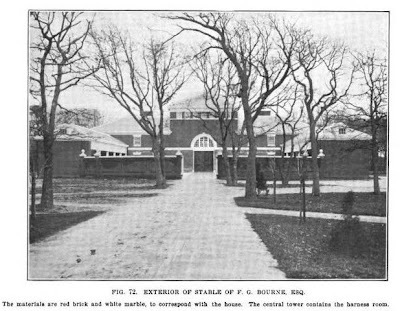 Bourne was Commodore of the New York Yacht Club from 1903-1905 and the estate included a boathouse and deep waterway to allow for large yachts to access the grounds. On the right hand side of the house is an 80-foot long greenhouse. 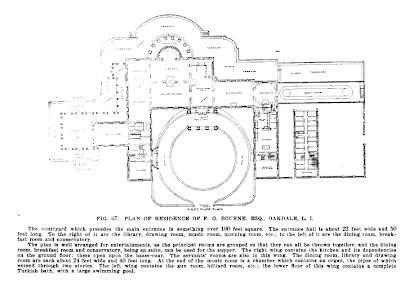 The residence also included a bowling alley, swimming "tank" and a Turkish bath. The estate had Olmsted landscaping with a 1,700 foot long driveway alleé (which has not fared so well over the years). 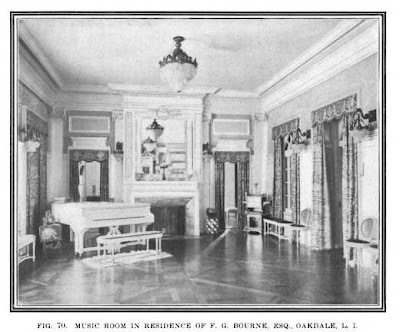 Bourne left a $25,000,000 fortune upon his death in 1919 and the house was sold for $1,000,000 in 1925. 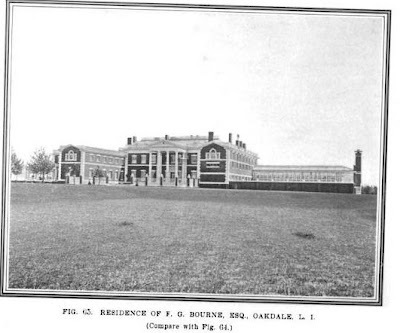 In 1926 the estate opened as the LaSalle Military Academy and in 2001 was sold to St. John's University. Click HERE to see 'Indian Neck Hall' on google earth. Click below to see 'Indian Neck Hall' entirely intact as the LaSalle Military Academy in a 1954 aerial shot. Thank you for posting Mr. Bourne's Indian Neck Hall. 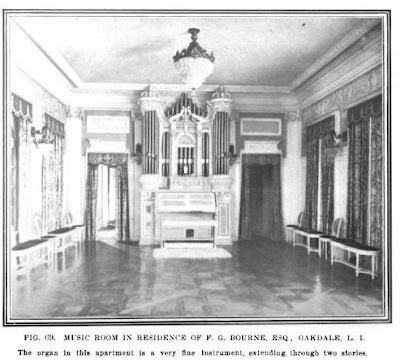 Around 1908 Ernest Flagg added a 100' long ballroom/music room to the house that held what was one of the largest privately owned pipe organs in the world. I have a photograph of the room, but there is no way to attach it to this comment. 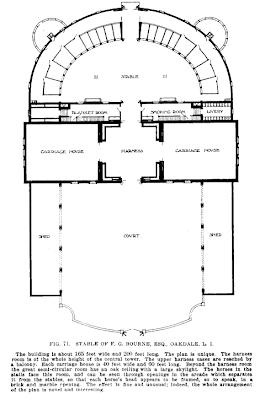 I understand Bourne also owned the ground floor apartment in the Dakota when it was first built. i was at wedding reception at indian neck hall 4 yrs ago. even in its slightly faded, and worn state the mansion and the layout of the various rooms are spectacular. in every room the detail work, is almost beyond description, to the point of the above comment the ballroom mentioned above easily held 300 people for a sit down meal. 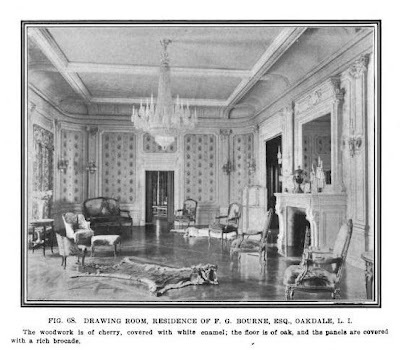 Flagg (and his understudy, Frank Whiting - Pratt Institute class of 1893, in particular) was also a favorite with some members of the Clark family who co-owned the Singer Sewing Machine Co.; although they never built anything as ostentatious as Indian Hall or the Dark Island structure. Whiting would design several Clark funded structures in Cooperstown (NY) ranging from what is the Farmer's Museum (today) to the Fenimore Art Museum to the Baseball Hall of Fame; while Flagg himself designed the one-time YMCA in the Village now serving as The Village Offices and Cooperstown Art Association. All of which stand today.